If you attended the Frisco Arts 5K and Walk last month, you may have observed a continuation of the relationship between Frisco Arts and Steinway & Sons. 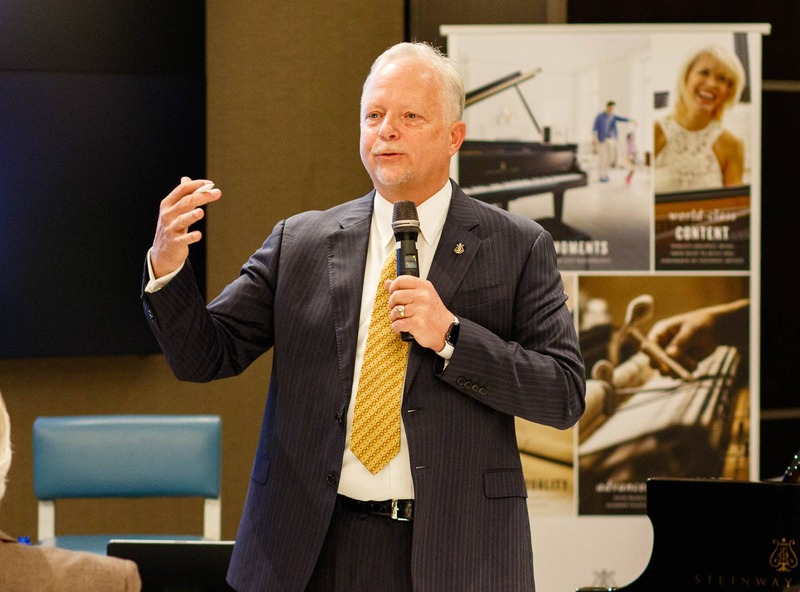 Last Friday, November 9, 2018, Steinway came back to Frisco, this time to the Lincoln Experience Center, for an evening of history, community, and music. Before the program started, the guests were entertained by the black Steinway & Sons “Spirio” series piano, which is also a player-piano capable of accurately reproducing live performances by Steinway Artists. Steinway calls Spirio “the company’s most significant product innovation in over 70 years”. Throughout the venue, Steinway displayed major elements of a piano – soundboard, cast-iron plate, keyboard – mentioning that the finished product consists of 12,000 individual parts. The host of the evening was the delightful Barry Samsula from WRR Classical 101.1 in Dallas. He introduced Steinway Artist Dzmitry Ulasiuk, an award-winning pianist from Belarus. The youthful and smiling Ulasiuk performed a selection from Prokofiev’s ballet Romeo and Juliet to get the crowd in the mood. The central performance of the evening, however, came from Bryan Elmore, Director of Institutional Sales and Educational Services for Steinway & Sons. He shared with the Frisco audience a detailed history of the company, dating back to the 1830s. The story of Henrik Steinweg, and his journey to the United States, where he became Henry Steinway and founded the finest piano-making company in the world, was full of personal detail and historic images. Part of the presentation was a 7-minute video tour of the company’s factory, narrated by John Steinway, Henry’s great-grandson and former Chairman of Steinway & Sons. One of the highlights of the event was a performance of “I Got Rhythm” by George Gershwin himself; the video recording of his performance was played on the video wall, while the audio was synced with the Steinway player piano, as if he played it live, right there in the Lincoln Experience Center. 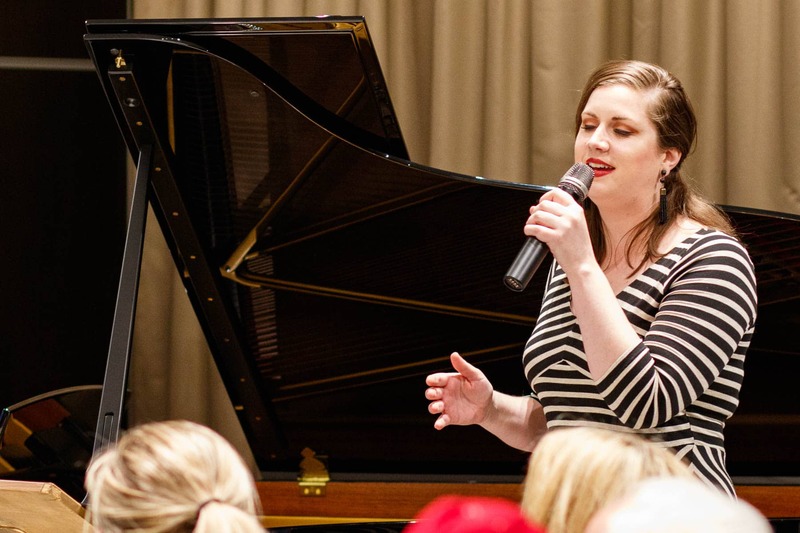 The vocalist was Abby, one of the employees at the Lincoln Experience Center; Elmore shared that, when they were preparing for the event earlier in the day, Abby sang along with the piano, and he was impressed with her talent. The two of them then performed “Satin Doll” along with a video recording of Duke Ellington’s performance. Both performances represented a marvel of modern technology, while at the same time connecting the audience to the rich history of Steinway pianos. Elmore also added that there are a number of schools in Texas that switched exclusively to Steinway products (including Collin College!). He shared that the Fort Worth ISD will be added to the list, as it is about to receive one more Steinway delivery next week. His wife Laura read a few touching letters from FWISD students revealing how much it meant to them to be playing on the world’s finest pianos. We also heard from Casey Saliba, VP of Sales and Marketing for Steinway Pianos (and his wife Danny), who explained that the white piano on display was the special John Lennon edition of their Series M.
The story says that the Beatle bought the white Steinway to his wife Yoko Ono in 1971 and that he wrote “Imagine” on it. 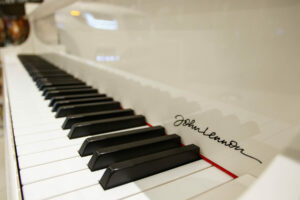 The beautiful white instrument had several details reminiscent of this heritage – from “You may say I’m a dreamer” written on the inside of the case, to John’s signature on the far right of the keyboard. Ulasiuk returned to treat us to some Rachmaninoff on the Spirio, but the closing performance belonged to Frisco’s own Tammy Meinershagen, Executive Director of Frisco Association for the Arts. She’s more commonly known for her performances on the violin, so it was a rare treat for the audience to hear her spirited rendition of Chopin’s “Fantasie Impromptu”. Tammy also reminded the audience that the tickets are still available for “A HeARTfelt Celebration”, a major Frisco Arts event on November 30, 2018, at Verona Villa in Frisco. The event is a celebration of a remarkable year of growth for the organization, and will feature performances by several world-class artists, such as electric violinist Zuriel Merek and Broadway star David Gaschen, who played Phantom of the Opera in New York City. The evening’s refreshments will be provided by chef Tre Wilcox and the desserts by Nothing Bundt Cakes. Tickets can be purchased through Frisco Arts’ site and are $30 per person for members and $40 for non-members. Membership starts at $50 per year, and it allows access to unique experiences such as the Steinway & Sons event as well as discounted tickets to various other Frisco Arts’ events throughout the year.